For the sesquicentennial of Lincoln’s murder, The Library of America has just published President Lincoln Assassinated!! The Firsthand Story of the Murder, Manhunt, Trial, and Mourning, which gathers more than eighty eyewitness reports, newspaper articles, medical records, trial transcripts, speeches, letters, diary entries, and poems. What’s the aim of this collection, what sorts of insights and discoveries do you hope readers will find? The idea is to bring readers back to the very moment of Lincoln’s death one hundred and fifty years ago and show how his mourners, his avengers, his admirers, and his foes all reacted. From the people in the Lincolns’ box that night to the funeral to the testimony at the trial of the conspirators, here are the fascinating firsthand accounts of the unfolding events, expressing shock, sorrow, indignation, and thirst for revenge. In the days of emotional upheaval that followed, and later, we see the event fully considered, what it meant for posterity, and the elevation of Lincoln, in literature and memory, into an American icon. It’s pretty remarkable to hear these voices again. What does the experience of reading these contemporary, firsthand eyewitness accounts offer readers that standard narrative histories don’t? There are many wonderful books about the assassination and its aftermath. But they’re unavoidably reflective and interpretive. The firsthand accounts, written in a rush of immediate emotion, have a palpable reality to them that one can’t find in narrative history. These writers did not know how events were going to turn out. Newspaper reports were long and beautifully written. The true-crime-type reports of the manhunt for the conspirators are edge-of-seat dramatic. And the lamentations, familiar and unseen, prose and poetry, take a reader’s breath away. What do the pieces tell us about the diversity of responses to Lincoln’s murder in the North and the South? Not everyone mourned Lincoln, as my introduction tries to make clear. But I think it’s fair to say that the overwhelming number of Northern responses, even from Democrats, was respectful, bordering on reverential. Partisan politics was for a time forgotten in the wave of mass grief. Recent studies suggest a wave of celebratory defiance, but in truth these were isolated incidents—quantitatively they add up to very, very little. Read, for example, the reporting from the anti-Lincoln New York World. They once ridiculed Lincoln—taunted him—and now they echoed the voice of grief. What does the volume tell us about Lincoln’s place in the stories Americans tell about themselves, then and now? 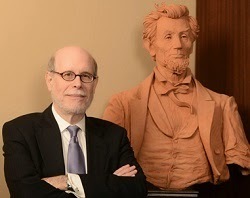 Murdered or not, Lincoln would always have occupied a significant place in American history as the president who preserved the Union and issued the Emancipation Proclamation. He certainly thought so, and I couldn’t agree more. But as this book reveals, Lincoln achieved an almost divine status in America’s so-called civil religion by becoming the symbolic final casualty of the war for union and freedom. In giving his life that the nation might live—as some saw it, and to paraphrase his own tribute to fallen soldiers at Gettysburg—he became a martyr to liberty, and you can see that sacred place emerging for him as the literature continues to appear in the months and years following his death. Are there writers you came particularly to like or admire while working on the book? I love the newspaper writers—and I am assuming that the “Big Three” New York editors, Henry Raymond of the Times, James Gordon Bennett Sr. of the Herald, and Horace Greeley of the Tribune, wrote or contributed much to the most important editorials their papers ever published. I am also quite taken with the overseas eulogies, from Ibsen, Tom Taylor in London, and the somewhat cooler comments by Disraeli. I can’t help adoring Whitman—he was unparalleled in wringing every last drop of literary opportunity he could wrest for himself after Lincoln’s death. On the one hand the masterful long elegy “Lilacs,” on the other the simpler “Captain,” which was his big performance encore for the rest of his career as a lecturer and reader. I guess my newest favorite is diarist George Templeton Strong, who scrawled daily entries in a tiny hand in his journals for his entire life—he’s quite extraordinary, great attention to detail. Most interesting discovery you made while assembling the book? The letter from Clara Harris, the senator’s daughter who was in the presidential box when Lincoln was shot. She confides to a friend that all the spurting blood that souvenir-hunters later swabbed, saved, or sold from the scene, belonged not to Lincoln (she was right—his wound was impacted), but to her poor fiancé, Henry Rathbone, whom Booth slashed with a knife before jumping to the Ford’s Theatre stage. Henry bled profusely and nobody paid much attention with the president of the United States lying unconscious. All those blood-stained fabrics that collectors lust after today—boy, would their owners be shocked if they were somehow subjected to a DNA test. Piece or pieces you think readers will find most surprising? I think readers will be galvanized by the testimony we reprint from the trial of the assassination conspirators. It’s rarely printed in such detail. I think it takes the alleged mystery out of the plot—it was all Booth’s and he was rather crazy. No Catholic Church plot, no Confederate government last gasp. One racist, wild-eyed actor who couldn’t differentiate between his stage roles like Marc Antony and real life, and a small band of impressionable followers. Although their audacious plot to dismember the entire government wasn’t entirely successful—the conspirator assigned to kill Vice President Andrew Johnson couldn’t bring himself to do it, and General Ulysses S. Grant left town rather than join the Lincolns at Ford’s Theatre—Lincoln was not the only victim. Secretary of State William Seward nearly died as a result of a brutal knife attack that same night. To some Americans, the world as they knew it was coming to an end. How does Lincoln’s assassination compare with more recent national traumas, such as the assassination of President Kennedy and the September 11 attacks? I lived through the JFK assassination and even for/as a kid, the shock and sadness were palpable. But Kennedy died a man of great promise unfulfilled; we mourned for a beautiful family of course, but also a presidency largely incomplete—what might have been. Lincoln, on the other hand, died at the apex of his power and popularity, triumphant. I wasn’t there, although sometimes I feel I was, but this volume shows us that Americans mourned the senselessness of the tragedy—an act that made a huge hero into an even greater one (perhaps more like FDR). September 11 was yet another kind of story—that one compares more, I think, to Pearl Harbor, a day that provoked grief and anger over wanton destruction and an assault on the homeland. They’re all somehow linked I suppose in our national litany of violence and death. I still think that Lincoln’s murder stands out—the first presidential assassination, of a man who had been underappreciated in his lifetime and was for many becoming truly beloved. I’m divided between the brilliant metaphor of Whitman’s “O Captain! My Captain!” and the incredibly professional report AP Washington bureau chief Lawrence Gobright somehow composed and filed just minutes after learning of Lincoln’s assassination—after rushing to the scene and somehow getting into the presidential box for a few minutes so he could report firsthand. He knew Lincoln well, had covered him ably during the war. He must have been in genuine shock, probably grieving too. But what a consummate professional. He wrote the stories that the whole country first read, before the analysts, eulogists, and odists took over. By the way, Lincoln was a pretty fair writer too, to say the least. The coda to the volume features Lincoln’s own unsurpassed comments on death and sacrifice—Gettysburg and the Second Inaugural—as well as his breathtakingly poignant condolence letters (Ellsworth, McCullough, and Bixby). It doesn’t get any better than that. Book excerpt: Read Gideon Welles’s account of the night of the assassination and of the chaotic days immediately following. Last summer we announced the titles for the first half of 2015; several of those titles are still at press and will be arriving in our warehouse in the coming weeks. Meanwhile we've been putting the finishing touches on the list of publications for the remainder of the year—including a collection gathering the works of an author (and subject matter) new to the LOA pantheon, as well as a two-volume anthology that resurrects several under-appreciated novels that are either out of print or hard to find. At the end of the list we note two last-minute additions—both paperbacks—to our spring list.